(3) Cabal meets Passworthy in the City Ways; they travel outside to the "Athletic Club in the hills"
Most significantly, what are two different meetings between Cabal, Passworthy, and their respective children - i.e. 4. & 10 - separated by a gap of three days and a number of other events, are effectively merged together to give the impression of a single meeting, punctuated by a brief cutaway to Theotocopulos and his followers. The latter does not appear at all in the Film Story, and it feels very much like an addition to explain the changed timeline. In the original version there are at least a couple of days for the discontent to grow after the broadcast, but in the surviving footage it seems that all it takes is a few choice soundbites from the rebel artist to provoke an instant reaction, hence the need for one of his entourage to declare that his words, "have struck fire!" It is notable that whilst in most cases the dialogue in existing footage is almost word-perfect when compared to the Film Story, the only major deviations are in the scenes involving Theotocopulos. The role was originally played by Ernest Thesiger, but Wells was so dissatisfied with his performance that he personally approached Cedric Hardwicke as a replacement. Thesiger was so unaware of this that he actually turned up at the film's premiere in February 1936 with a group of friends, so clearly the change happened once all of his scenes had been shot the first time around. The decision to drop Cabal and Passworthy's actual first meeting and subsequent journey through the City Ways was a difficult one, but at the time what was known of the film as a whole suggested that this was one sequence that had probably not been shot, let alone included even in the rough-cut. Whereas most lost scenes are represented by production photographs proving that they were at least rehearsed, if not actually filmed, there seemed to be absolutely nothing of what was quite a convoluted journey through and then outside of the Everytown of 2036. 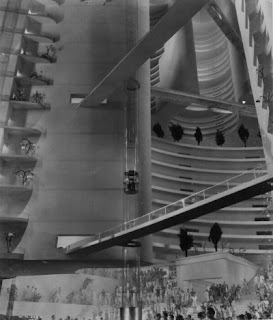 In his 1995 book on the making of the film, Christopher Frayling suggested that the technical requirements of the Athletic Club - with its huge flexible windows and complex sporting water-chute - may have been too great. Although there was much dialogue between Cabal and Passworthy, there didn't seem to be an easy way to incorporate it into the "Virtual Extended Version" of the film on the DVD, so it was omitted. So there he was, Oswald Cabal amongst the crowd in the City Ways, and to his right (i.e. on the left of the photograph), the almost unmistakable top of Raymond Passworthy's head! In retrospect, while I'd only recently acquired this particular still (in a job lot of seven from Australia), I wondered how I'd not spotted this detail before. A quick check of the other examples I have of it used elsewhere, however, showed that in all cases the bottom edge of the image had been trimmed off, so that Cabal's head was barely visible, let alone that of Passworthy. Finally we have some evidence that Cabal and Passworthy's journey through the city was actually filmed, but it will probably take the discovery of more photographs (the actual footage is too much to hope for!) to clarify the situation, although that may take some time. Based on the codes that appear on each still, there are at least 520 or so of them, of which I already own 91, and am aware of a further 41 - around a quarter of the total. of the camp, one hundred miles north of Baghdad and five men were wounded and a number of mules killed: "I was one who helped to bury the mules. They take a big hole, as if put in a shallow one, the jackals used to scratch them up." Without the bathing in the rivers and pools life under the harsh conditions would appear to have been impossible. "Food also improved, and we got meat instead of bully, and three-quarter ration of bread issued. We improved our health over here, being able to buy eggs and fruit of all kinds off the Arabs, and we all got fatter again!" In July the heat was terrific, and there was much sickness. Soon afterwards the young soldier was taken seriously ill, and with a temperature at 105, he lost consciousness, and was unconscious for some days. He had to be sent down the river to Baghdad, where the old Turkish barracks were converted into an hospital, and ultimately to Bombay. Since then he had been in the van of the marching and fighting and had come through to victory fit and happy. At the end of his interesting diary in 1917 he said: "I have a lot to be thankful for, and I can look to the future with confidence. May the end of next year's diary be written somewhere nearer home!" Probably it has been. Herbert's military records show that he joined up on 29 Nov 1915, at which time he was 27 years and 7 months old. Reflecting his peacetime trade, he joined the Army Service Corps at a saddler - number TS-10037 - and arrived at the Corps' base at Woolwich two days later. On 24 Oct 1916 he sailed for the Mesopotamian front, where he remain until 26 Aug 1917, when he was evacuated to India for medical reasons, as stated above. He eventually returned to the UK on 28 Dec 1918, seven weeks after the Armistice.